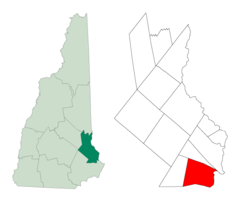 The primary settlement in the town, where 10,345 people resided at the 2010 census, is defined by the U.S. Census Bureau as the Durham census-designated place (CDP) and includes the densely populated portion of the town centered on the intersection of New Hampshire Route 108 and Main Street, which includes the university that dominates the town. Situated beside Great Bay at the mouth of the Oyster River, Durham was originally called "Oyster River Plantation". It was settled in 1635 by pioneers who traveled up the Piscataqua River and across Little Bay to settle at the falls of the Oyster River. The community rebuilt, however, and by 1716 Durham was a separate parish. Incorporated in 1732, Durham at first included portions of the present-day towns of Madbury, Lee and Newmarket. Because of its arable land, the town would develop as a farming community. Benjamin Thompson, a descendant of an early settler, bequeathed his assets and family estate, Warner Farm, to the state for the establishment of an agricultural college. Founded in 1866 in Hanover, the New Hampshire College of Agriculture and the Mechanic Arts moved to Durham in 1893 and became the University of New Hampshire in 1923. Thompson Hall, built in 1892 with an iconic clock tower, is named in his honor. Designed in the Romanesque Revival style by the Concord architectural firm of Dow & Randlett, it was listed on the National Register of Historic Places in 1996. In 2017, Durham became the first community in New Hampshire to recognize Indigenous Peoples' Day in place of Columbus Day. In 2018, the Oyster River Cooperative School District, which includes Durham, Lee and Madbury, adopted Indigenous Peoples' Day on its school calendar. The demographics of the town of Durham are strongly influenced by the presence of the campus of the University of New Hampshire. As of the census of 2010, there were 14,638 people, 2,960 households, and 1,544 families residing in the town. There were 3,092 housing units, of which 132, or 4.3%, were vacant. 7,266 town residents lived in group quarters such as dormitories, rather than in households. The racial makeup of the town was 93.8% white, 0.9% African American, 0.1% Native American, 3.2% Asian, 0.01% Native Hawaiian or Pacific Islander, 0.4% some other race, and 1.6% from two or more races. 2.0% of the population were Hispanic or Latino of any race. Of the 2,960 households, 23.0% had children under the age of 18 living with them, 45.8% were headed by married couples living together, 4.4% had a female householder with no husband present, and 47.8% were non-families. 25.2% of all households were made up of individuals, and 10.2% were someone living alone who was 65 years of age or older. The average household size was 2.49, and the average family size was 2.94. In the town, 8.6% of the population were under the age of 18, 64.3% were from 18 to 24, 7.7% from 25 to 44, 12.5% from 45 to 64, and 6.9% were 65 years of age or older. The median age was 21.0 years. For every 100 females, there were 85.7 males. For every 100 females age 18 and over, there were 83.5 males. For the period 2011-2015, the estimated median annual income for a household was $71,190, and the median income for a family was $120,039. Male full-time workers had a median income of $72,197 versus $58,750 for females. The per capita income for the town was $22,650. 24.5% of the population and 1.4% of families were below the poverty line. 0.7% of the population under the age of 18 and 5.1% of those 65 or older were living in poverty. Sam Fuld, outfielder with the Chicago Cubs and Tampa Bay Rays, currently with the Oakland Athletics. Benjamin Thompson, farmer, businessman and benefactor of U.N.H. ^ a b United States Census Bureau, American FactFinder Archived 2011-04-23 at the Wayback Machine, 2010 Census figures. Retrieved March 23, 2011. ^ "Durham, NH". The Great American Stations. Archived from the original on 2014-11-29. Retrieved Sep 5, 2014. ^ Butterfield, Martha Lamson (2016). The land in our hands: Burley-Demeritt Farm in Lee, NH : its history. p. 21. ISBN 9781329902954. ^ "Will of Benjamin Thompson - University of New Hampshire Library". www.library.unh.edu. Archived from the original on 20 October 2017. Retrieved 3 May 2018. ^ "National Register of Historic Places Listings -- December 13, 1996". Archived from the original on May 26, 2017. Retrieved November 17, 2017. ^ "Durham to celebrate Indigenous Peoples' Day on Columbus Day | New Hampshire". UnionLeader.com. Retrieved 2018-10-11. ^ Allee, Daniela. "Oyster River Cooperative School District Adopts Indigenous People's Day". Retrieved 2018-10-11. ^ "Durham Town Records, New Hampshire". University of New Hampshire Library. Archived from the original on February 2, 2014. Retrieved February 3, 2014. ^ "Police Dept. History". Town of Durham, NH. Archived from the original on July 20, 2011. Retrieved December 16, 2010. ^ "A Welcome from the Chief of Police". Town of Durham, NH. Archived from the original on August 13, 2011. Retrieved December 16, 2010. ^ "Durham PD Programs". Town of Durham, NH. Archived from the original on August 13, 2011. Retrieved December 16, 2010. ^ a b "Durham Fire Department History". Town of Durham, NH. Archived from the original on December 15, 2010. Retrieved December 16, 2010. ^ U.S. Geological Survey. Dover Quadrangle, New Hampshire-Maine map. 1:62,500. 15 Minute Series (Topographic). 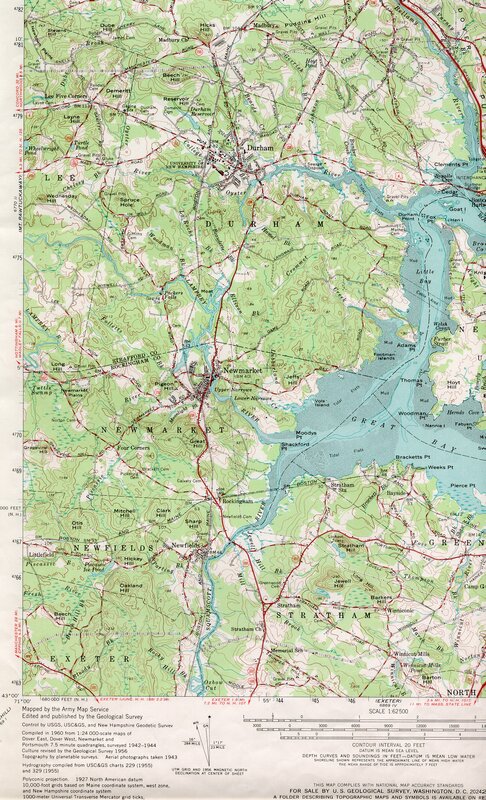 Washington D.C.: USGS, 1956. Available from University of New Hampshire Dimond Library Documents Department & Data Center, "Archived copy". Archived from the original on 2009-03-26. Retrieved 2009-03-17. CS1 maint: Archived copy as title (link) accessed 2009-03-17. ^ Foster, Debra H.; Batorfalvy, Tatianna N.; Medalie, Laura (1995). Water Use in New Hampshire: An Activities Guide for Teachers. U.S. Department of the Interior and U.S. Geological Survey. Archived from the original on 2011-06-21. ^ a b c "Profile of General Population and Housing Characteristics: 2010 Census Summary File 1 (DP-1): Durham town, Strafford County, New Hampshire". American Factfinder. U.S. Census Bureau. Retrieved November 9, 2017. ^ "Selected Economic Characteristics: 2011-2015 American Community Survey 5-Year Estimates (DP03): Durham town, Strafford County, New Hampshire". American Factfinder. U.S. Census Bureau. Retrieved November 9, 2017. ^ Doyle, Bill. "NESN's Jack Edwards calls on his dramatic heritage". Worcester Telegram. Archived from the original on 2014-04-24. This page was last edited on 21 March 2019, at 16:51 (UTC).